It was an easy and quick DIY fix, especially since I didn’t have to go to the store for foam (we had some here already from one of the hubby’s past puppet projects). Because it was so easy, I thought I’d share with you and show you how to do it just in case you ever need to. 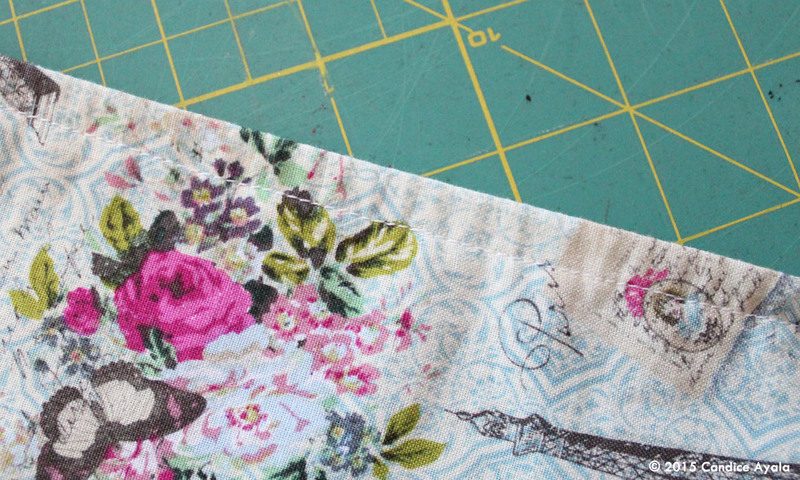 What I love most about this project is that you can customize your cover with just about any fabric you choose! 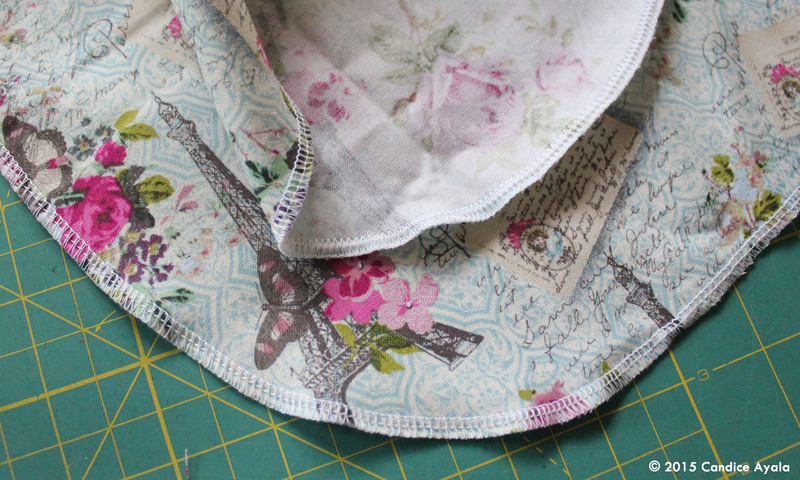 I chose one of my VERY FAVORITE fabrics because I’m not too fond of ironing, and I figured maybe if my cover was pretty to look at, I wouldn’t mind ironing so much! haha! STEP 1: Remove old padding and cover. 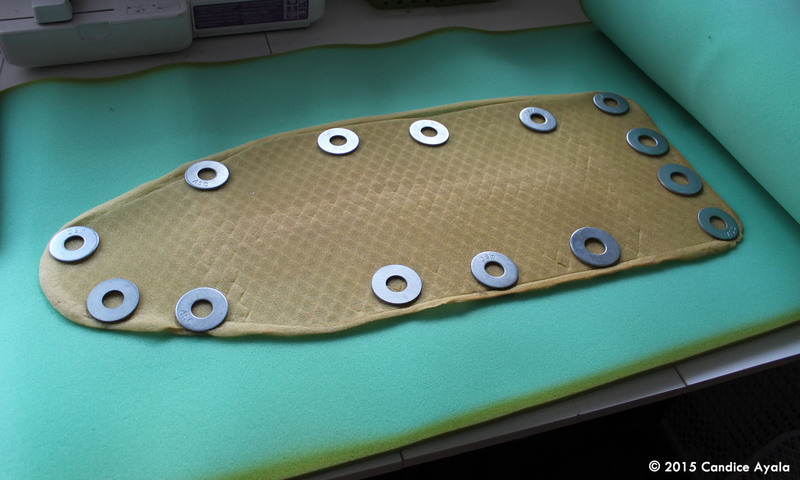 Use the old padding to create a template for your new foam padding. Secure with pattern weights (so the foam doesn’t shift), Trace it, or cut directly around. 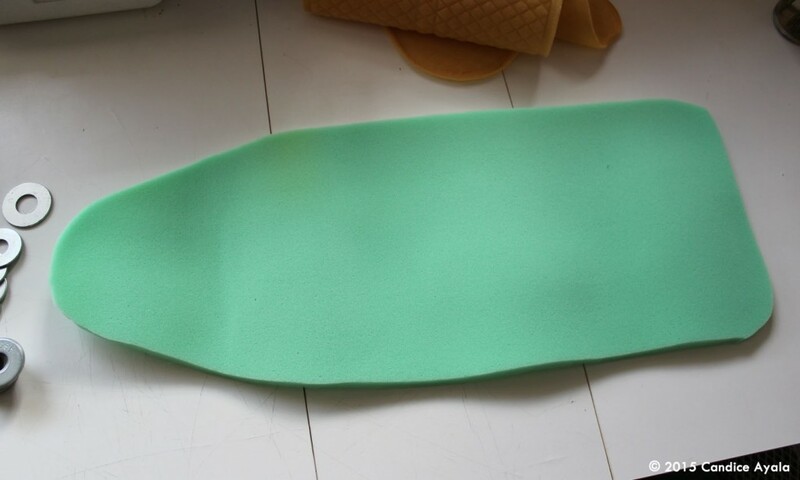 Now you have your new foam padding. 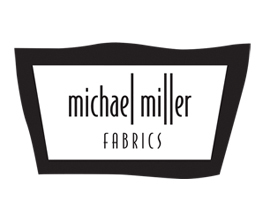 STEP 2: Use NEW foam padding to create your FABRIC cover template. 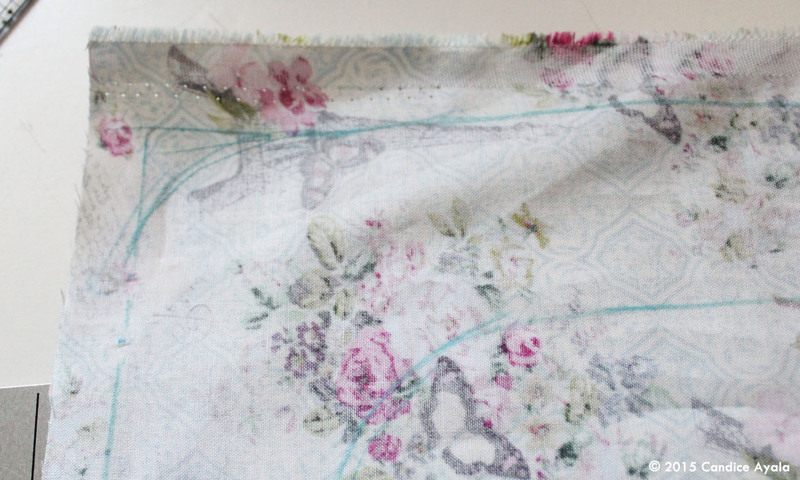 Place fabric wrong side up and TRACE (with your marking tool) the outline of your foam backing. STEP 3: Once you have traced your outline, use your ruler to add 2-3 inches around the entire perimeter of your traced template. 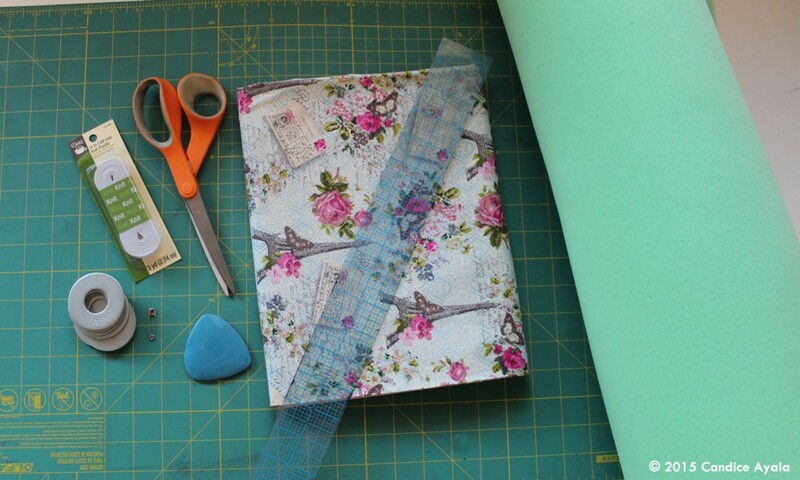 These extra inches will be used to create the elastic casing around the cover. STEP 4: Once you’ve added your extra inches, cut your template out. 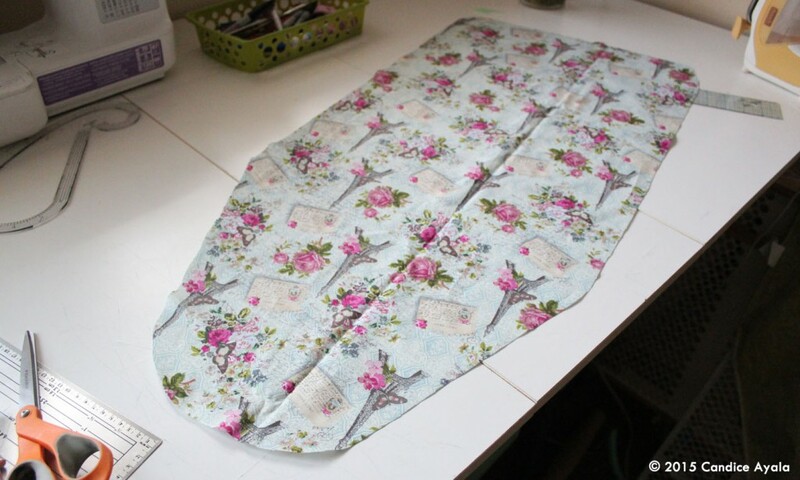 STEP 5: Serge or sew using a small zigzag stitch right along the edge of your fabric, all the way around your template. 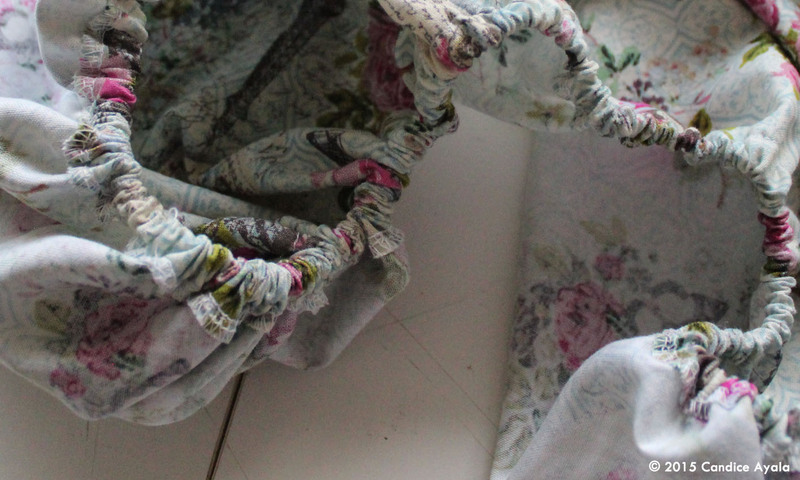 This will prevent the fabric from fraying. 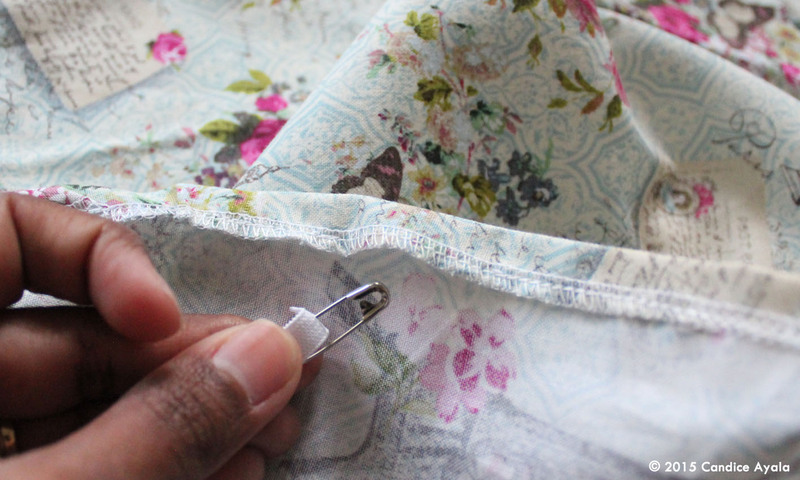 STEP 6: Fold your edges 1/2 inch under and sew all the way around to create your elastic casing. REMEMBER to leave a small opening (about an inch wide) so that you can feed your elastic through the casing. STEP 7: Take your elastic and secure the safety pin at one of the ends and then feed the elastic all the way through the casing until you come out at where you first started. DO NOT SECURE ELASTIC ENDS HERE. 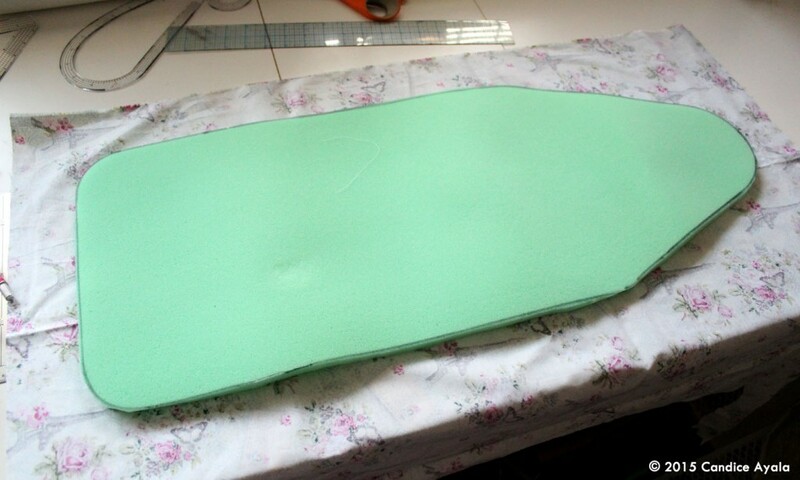 STEP 8: Place your NEW FOAM and NEW COVER unto your ironing board. 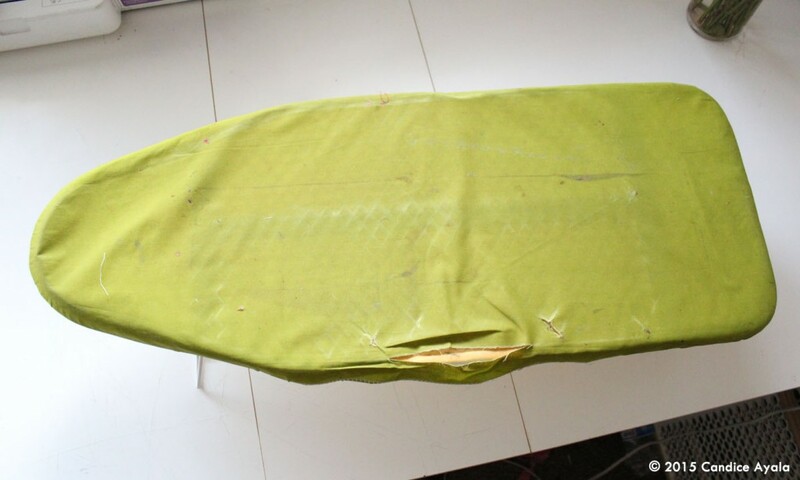 THEN TURN IRONING BOARD OVER. 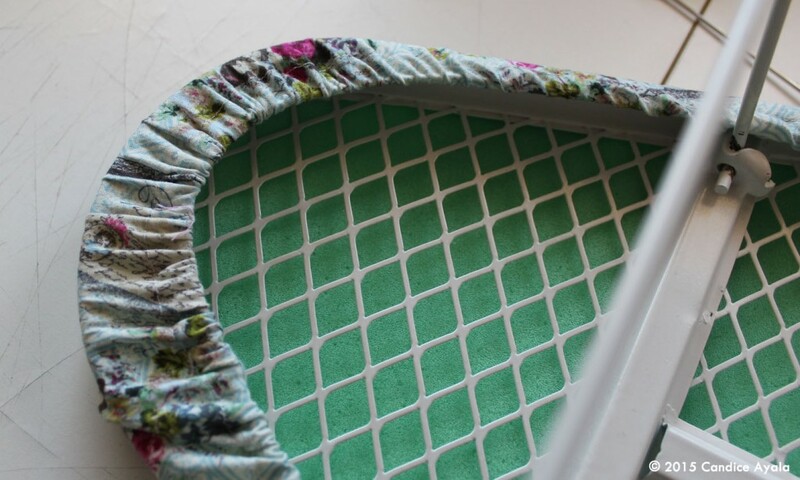 With the ironing board turned over, pull at your elastic ends until your cover becomes tight and snug over the iron board. SECURE ELASTIC ENDS HERE. (I tied a knot). 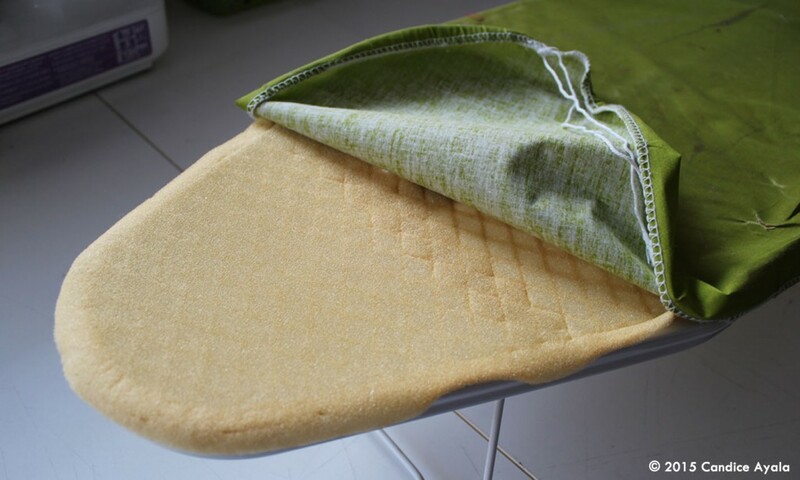 STEP 9: With your elastic ends secured, remove cover from ironing board, take it to the sewing machine and stitch your opening close. 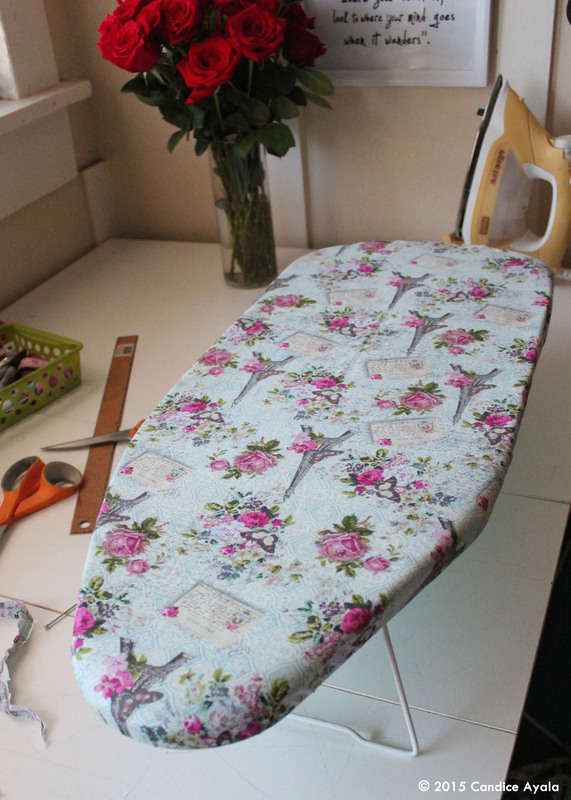 STEP 10: Replace finished cover on your ironing board, THEN take a step back to admire your work! CONGRATULATIONS!! 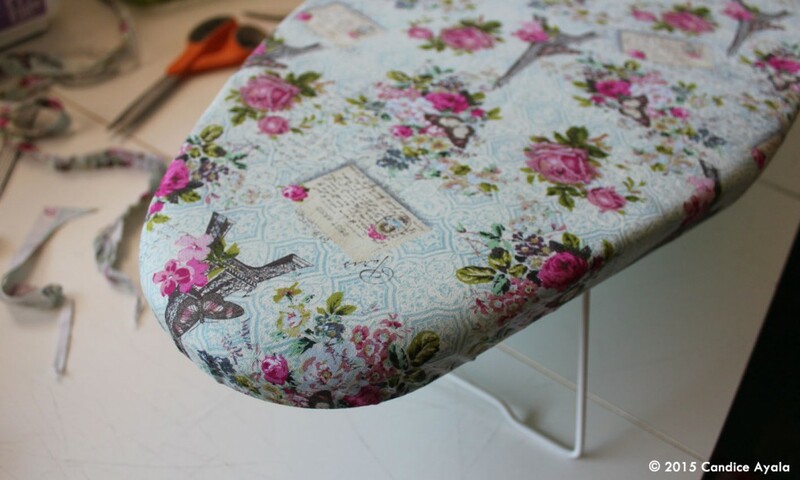 !YOU HAVE SUCCESSFULLY TRANSFORMED YOUR OLD DINKY IRONING BOARD INTO A NEW ONE! And there you have it! Hope you guys found this tutorial useful. I’ll talk to you soon, I’ve got some ironing to do! haha!! « PATTERN REVIEW + Early Valentine Date with the kids. Love your tutorials. Very detailed and great step by step photos. I will be adding this project to my “To Do List” too. My new favourite blog! Thank you for all your hard work and for sharing with us! I love DIY, and tutorials! Keep em coming, and know you are appreciated! This is so dangerous to read and see, because im all out of time to do all the things I want to do, hehe. Just found your site this morning!!! LOVE LOVE LOVE IT! I have been making a few dresses for my 1 year old granddaughter, but haven’t attempted anything for my 3 year old grandson. It is great to see patterns for both. But first off I am making me a new cover for my ironing board, because mine looks similar to yours before its transformation. Just wanted to say thank your for all your wonderful creations and motivation. Hi there Ellen!! Thank you so much for the sweet comment! haha…Truth be told, its so much more easier to sew the cutesie things for the little girls, but I had to be fair and sew up some stuff for the boy cub too =) I’m so glad you found the ironing board transformation useful! =D Thank you so much for joining me on my sewing journey! Happy Sewing to you too. Best regards, Candice! 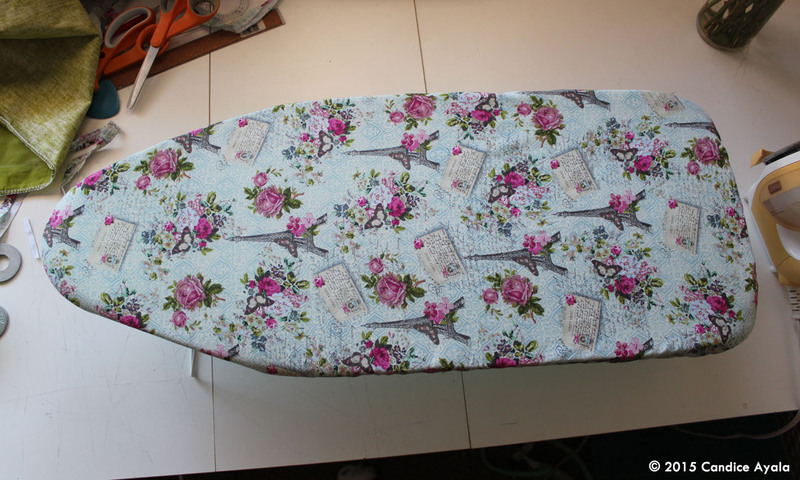 This is the BEST ironing board cover tutorial I have EVER READ!!!!! I’ll be making two this weekend. Thank you so much!